On the eve of Christmas and a proposal, Natalie Appleton discovers she doesn't want to settle for sevens and starts over. So, she abandons everything in Alberta for Bangkok. Along the way, with startling illumination, honesty, and humor, Natalie unpacks the past that caused her to flee: cheating hearts, small-town suffocation, a tattered family, and a genetic disposition to madness. In Bangkok, Natalie kills an albino gecko, crawls into bed with a lamp seller, and nearly calls off her quest when she's almost attacked by a leather vendor. And then, at a grimy guesthouse one year after arriving in Thailand, everything changes. 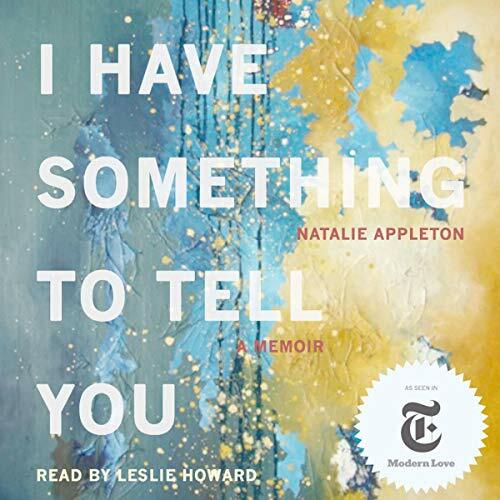 I Have Something to Tell You is a lyrical, vulnerable exploration of the meaning of love, family, home, and the magic of the universe. It's also a captivating window into two equally exotic worlds - the oil-patch-laden prairies and the resplendent Thailand. This is a story for anyone who remembers feeling lost in their 20s, for anyone who has been afraid to leave - a crummy partner or town or job - and for anyone who has ever wondered, "What if?" This is a love story. A love story with a country, an experience, and finding yourself. From the beginning, I understood Natalie. She's young. She's bright. She knows there's got to be something more to her life than having re same conversations with the same people for the next forty years. And so she goes off to find herself and teach English in Thailand. I went off to do disaster relief. Like I said, I get her. Sometimes, you feel a tub and you have to leave. I enjoyed this memoir. I got to 'see' a place I'll probably never visit. Meet all sorts of people. That isn't to say I always liked Natalie. She does stupid things at times. Sometimes she was unbelievably naive. But it was like the people I volunteered with, you get close and you find yourself fondly shaking your head of laughing with them or occasionally gasping in horror. And the epilogue. The epilogue nailed this story from a memoir I enjoyed to something I will relisten to and suggest to others. A reminder that there are things that are meant to be and that sometimes we simply have to follow and wait. The narrator was great. She WAS Natalie.She made it go from a book to a story being told to me by a friend. Follow your heart. Give this book a try. You just might find what you need. I was given this book for free at my request in exchange for a fair review.